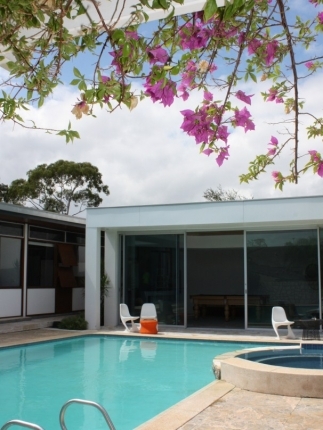 If you’ve spent much time in Perth at the beaches near Floreat and City Beach, chances are you’ll have driven past this place - Paganin House, this iconic 1960s house on The Boulevard. 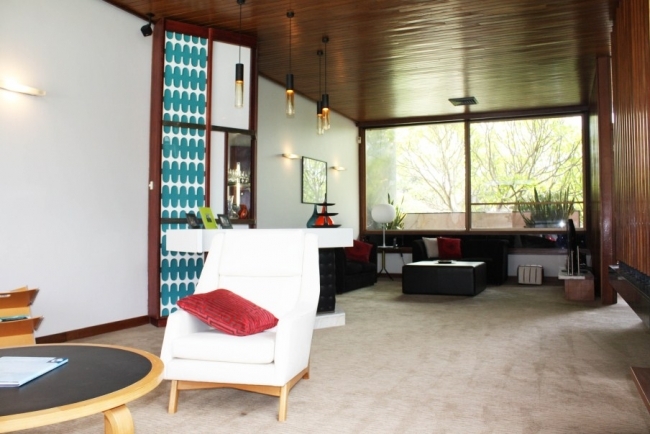 The house was designed by renowned Bulgarian-born architect Iwan Iwanoff, who designed what many people in Perth believe to be the coolest houses in Perth (his famous Marsala House in Dianella still has a light-up disco floor!) 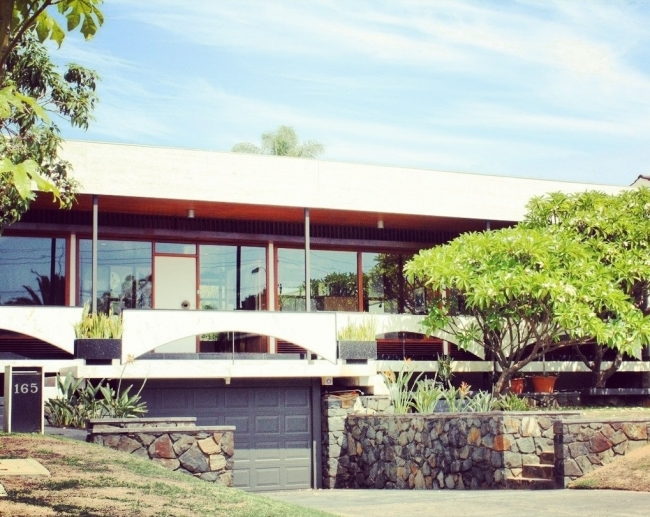 Iwanoff died in 1986 of pneumonia, but his name crops up time and time again in unofficial listings of Perth’s best houses and Perth’s best architects, and it will continue to do so, because decades on his houses still draw oohs and ahhs. This place is one. ABOVE: An Iwanoff house and an Instagram filter and you could almost swear this pic was taken in 1965! Paganin House today in 2013. 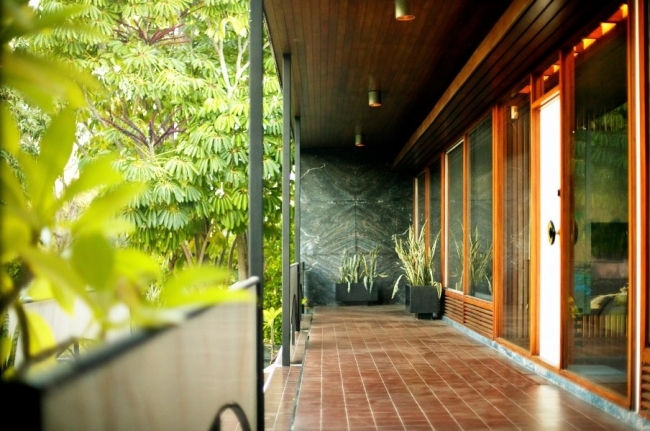 MARBLE GALORE: The front veranda. The home’s original owners were marble and timber merchants and the home is extensively finished in marble – even around the sides of the house, and to the internal staircase that leads to the undercroft garage. 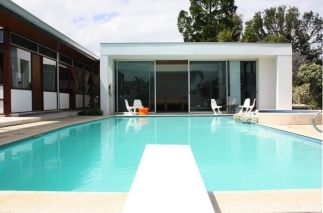 The paving around the pool is marble and so is the floor of the pool house. Photo by Acorn Photo. NEUTRAL WALLS: When she renovated Lisa kept the wall colours predominantly neutral, letting the home’s extensive timber features and colourful accents do the talking. The new kitchen now has white Laminate cabinets with timber edging and some solid timber feature cabinets. “The previous owners had done a renovation in the 80s and put in a pink granite kitchen but I stripped it back to what it was,” she says. ABOVE LEFT: The orange glass pendant lights above the bar are original. 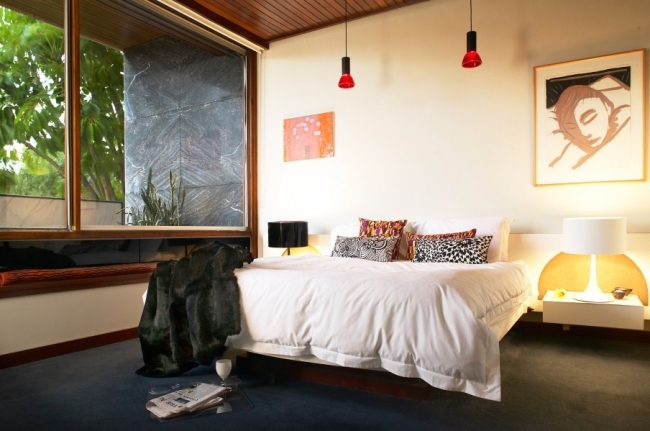 Lisa used to own a lighting company and the house has wonderful feature lighting, with much of it on dimmers. 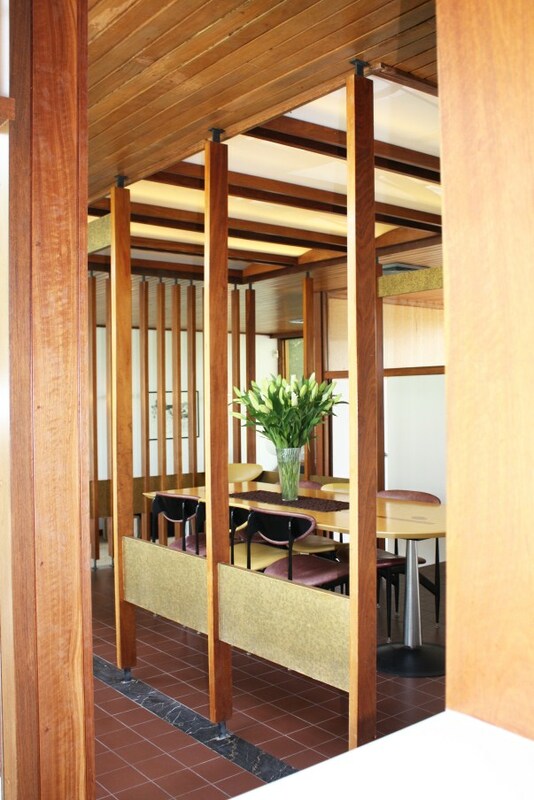 ABOVE RIGHT: The dining area is all original - even the ceiling with concealed lighting beyond the panels. ABOVE: The main suite. Although two of the bedrooms are at the front of the home, Iwanoff designed them so that their floor level lies beneath the balcony. 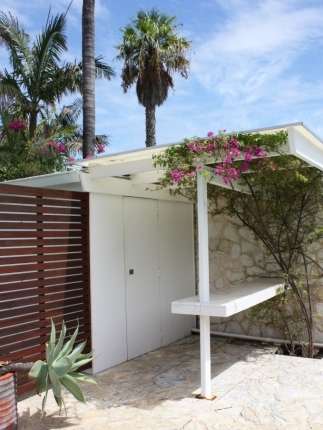 This feature, teamed with the marble privacy panels and the gentle slope of the land, ensures that no-one from the street can see into the bedrooms. There's a reason this architect is so respected! Photo by Acorn Photo. LET’S GO OUTSIDE: The pool area is my favourite part of this place. It cries out for pool parties and for everyone to dance to Twisting By The Pool. 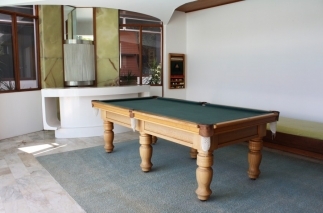 GAME OF POOL BY THE POOL? 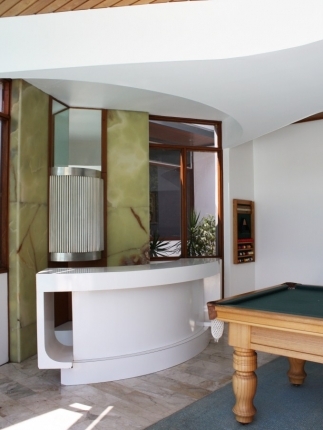 The pool house has a bar (hidden behind that silver curved cupboard) which is flanked by marble cladding. The pool house also has its own marble-finished change room with toilet and shower. ABOVE: You know you have a party house when your house has three bars. Paganin House has one bar in the living area, one in the pool house and this one by the pool. Kind of has a Spanish feel don't you think? Born in 1919, Iwanoff migrated to Perth in the 50s but it wasn’t until the 60s that he started his own practice here and Perth is lucky enough to be THE city of his work. His architecture is now recognised internationally and he is regarded as one of our city’s best and most influential architects for his expressionistic style and his striking Brutalist buildings. 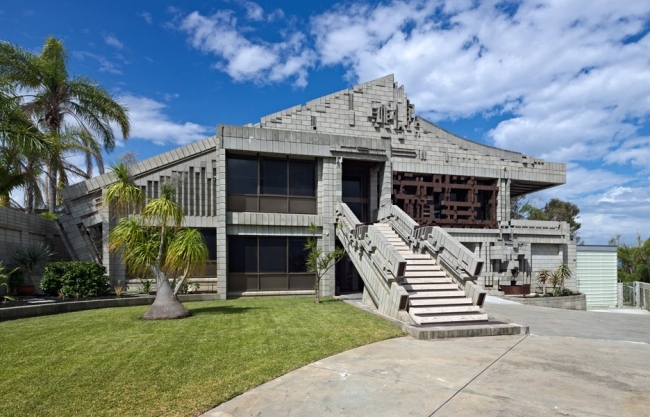 Iwanoff houses have so many fans in Perth that I find it interesting that Marsala House in Dianella is the only one of Iwanoff’s houses that are on the heritage register. We haven’t really come to the point yet where we are putting 60s and 70s Perth houses on the heritage register yet (Marsala was built in 1976 and is the youngest house to be heritage-listed in WA) and it seems a bit of a shame, especially when there are so many Iwanoff fans who would kill for one of his homes. 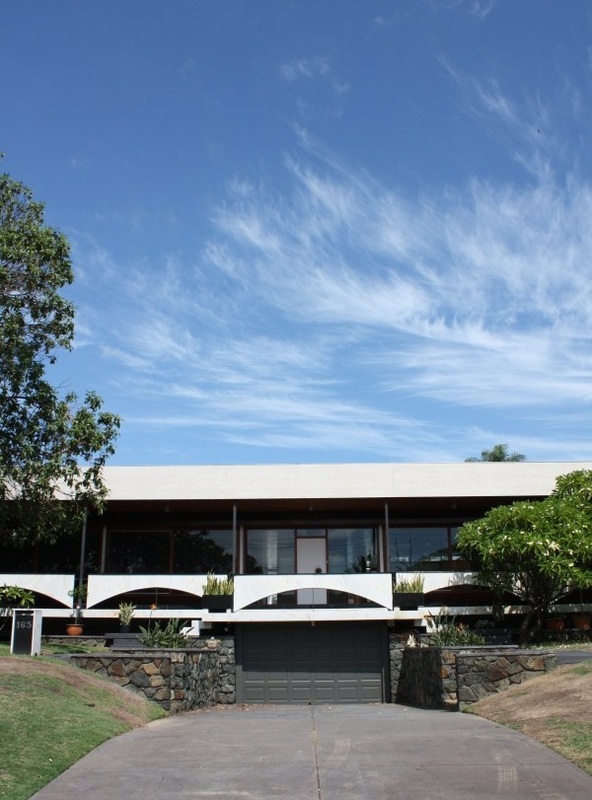 ABOVE: Iwanoff's heritage-listed, recently restored iconic Marsala House. It reminds me a bit of the Nome King scene in Return to Oz. Paganin House owner Lisa Fini tells me an Iwanoff in City Beach was knocked down recently, to the horror of many Iwanoff fans. So I guess you just hope that Iwanoffs go to people who appreciate them. Lisa is one of them. She bought Paganin House in 1999 after years of lusting after it (and she doesn’t dress like Nancy Sinatra). “I’d always loved this house,” she smiles. “When I was a little girl we used to drive past it all the time.” It’s not just her who has a soft spot for this place. “It seems like everyone who speaks to me says, ‘Ohhh! It’s my favourite house in Perth!’” she laughs. 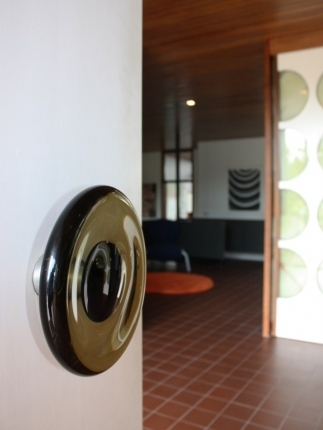 ABOVE: The original front entry door opens onto a foyer. Straight ahead is the kitchen, which can be closed up with a pair of marble inlay doors. 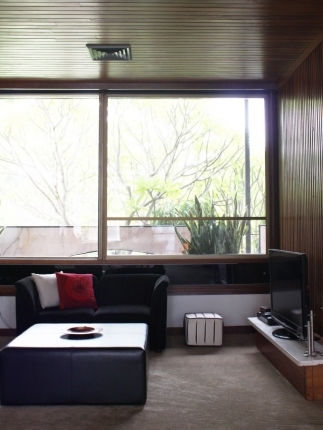 To the left of the kitchen is a small sitting area and the home's four bedrooms. 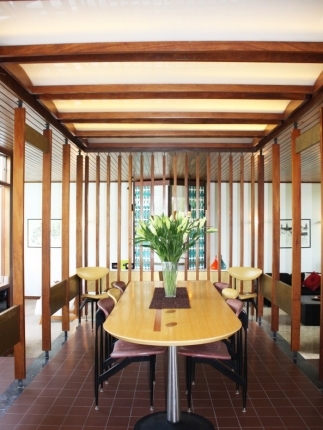 To the right is the dining area, the study and the sunken lounge with bar. 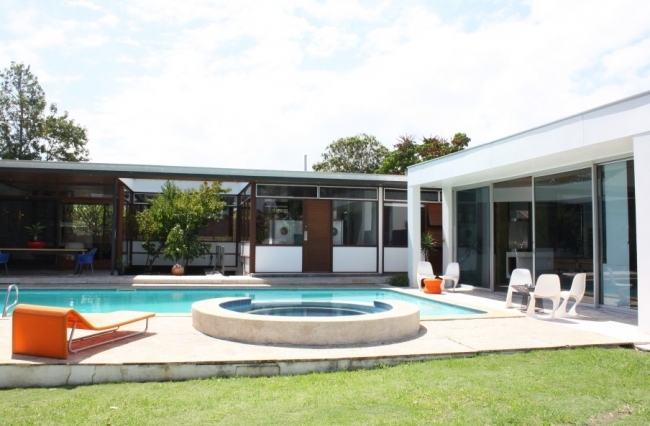 DINE WITH ME: To the right of the kitchen is the dining with slatted walls and beyond that the sunken lounge that overlooks the 10m pool with diving board and the garden. 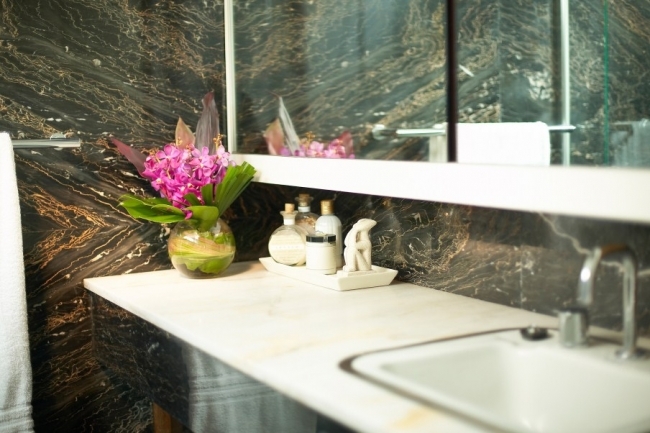 LUXE: The marble-tiled ensuite to the main bedroom. Photo by Acorn Photo. 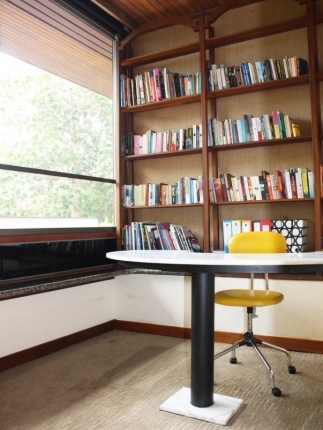 ABOVE: The study at the front of the home has an original curved marble top table. 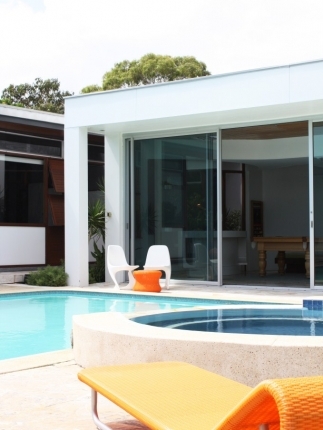 THIS IS GOING STRAIGHT TO THE POOL ROOM: The freestanding pool house overlooks the pool with diving board. 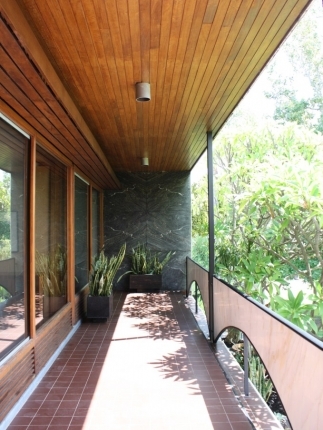 ABOVE: My favourite things about this house are the gorgeous elevation with the marble panels and the frangipani trees. 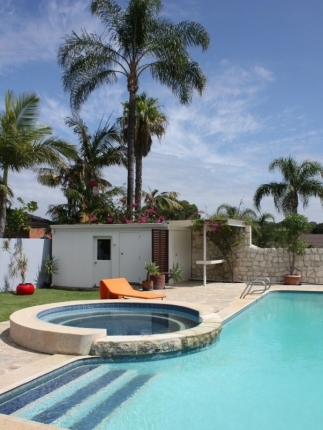 And the outdoor entertaining area, with the 10m pool with diving board and pool house. The whole place kind of makes me think of an edgier version of the Brady Bunch house. (I don’t think the Brady Bunch had three bars). 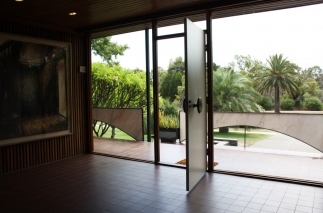 ABOVE: The pool house Iwanoff designed has huge floor-to-ceiling sliding doors - something we are seeing a lot in new houses these days, but back in the 60s it would have been rare! ABOVE: The marble surround fireplace in the pool room. ABOVE RIGHT: There is something about this garden and its location that reminds me of Breaking Bad. 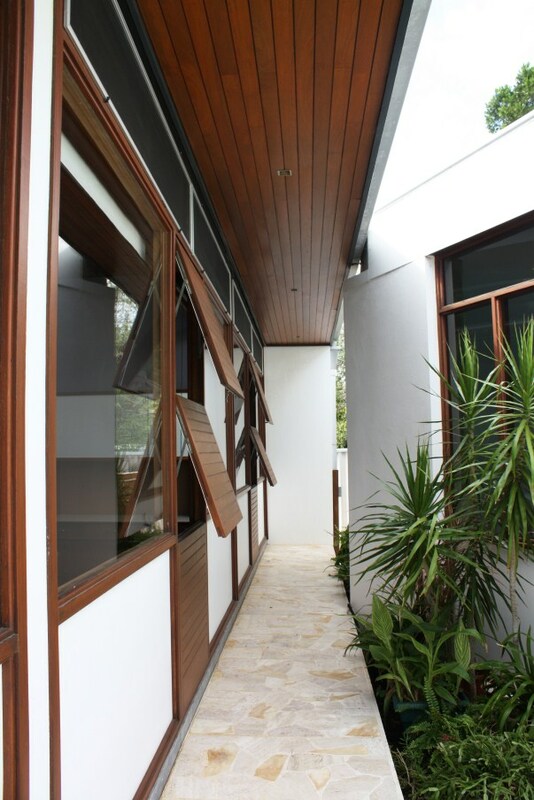 ABOVE: By the side of the house, jarrah panels can be lifted to allow for cross-ventilation. 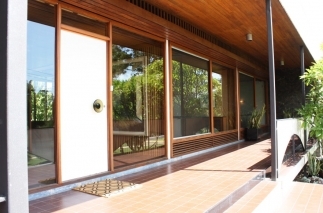 Iwanoff incorporated numerous solar passive principles into the house. RENOVATE AND REPLACE: Right in the centre of the house, the kitchen is the axis of this home. When Lisa bought the house it was a bit rundown. 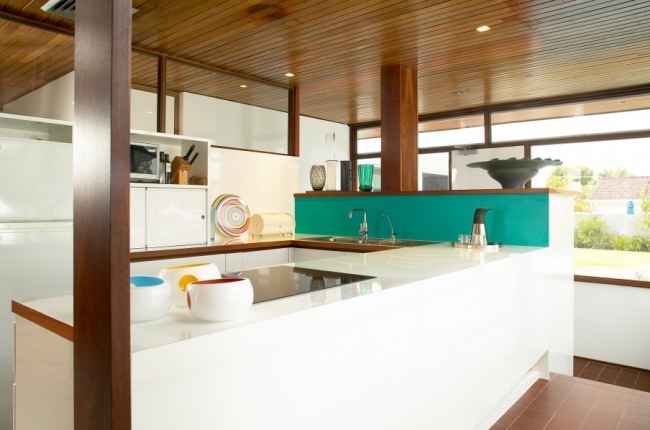 She began a restoration with the aim of keeping as many new materials as close as possible to the same materials that were originally used in the 60s – for example, she replaced the battered kitchen with 60s-inspired cabinets in laminate, not Laminex. Photo by Acorn Photo. 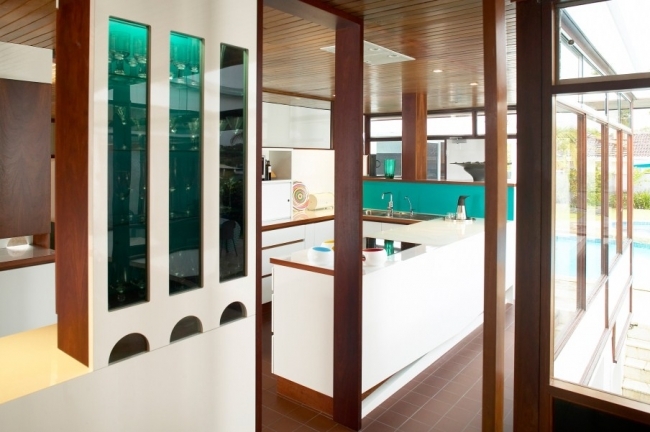 TURQUOISE SPLASH: Lisa had friends express disbelief over her choice of a turquoise glass splashback, but I think it works perfectly here – and the colour is picked up in the original turquoise glass panels of the bar in the living area. Photo by Acorn Photo. ABOVE: The house's original marble and timber merchant owners definitely went to town with the marble in their own home. 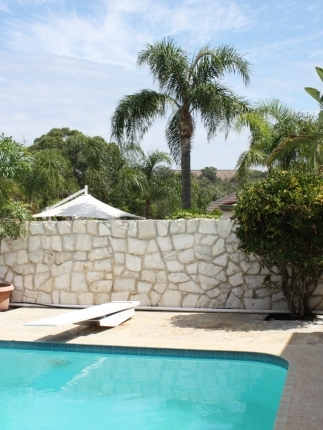 Marble was used around the pool, to the laundry drying courtyard and even to the internal staircase to the garage. 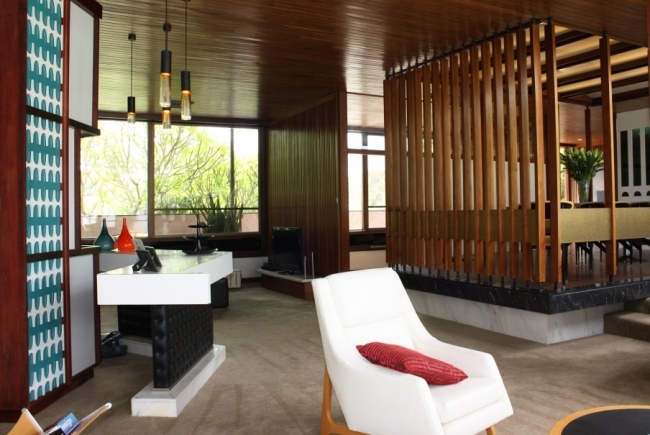 Paganin House has only changed hands once - Iwanoff designed it for its first owners, a family with four children, who moved into the house in 1965 and only moved out in 1999. 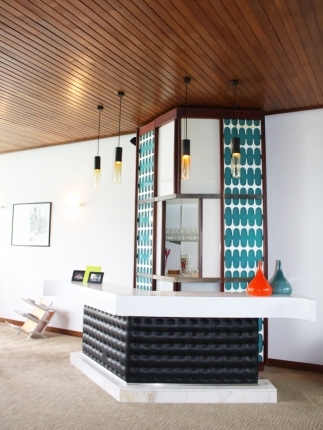 The house was well ahead of its time, built in an age when open-plan living was still rare. 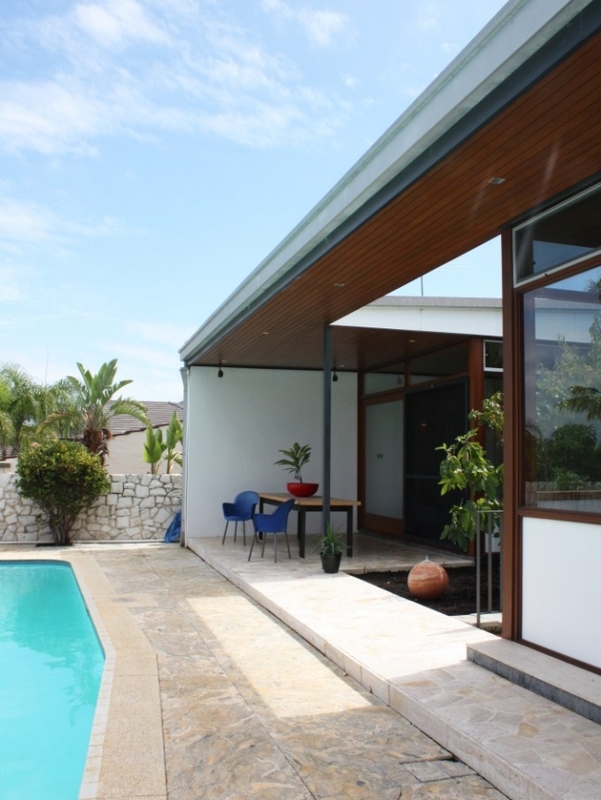 It also has features that many houses didn't have back then - such as internal entry to the double garage, full-height sliding doors to the pool house, numerous bars (the house has three!) It's now going to auction. Lisa says one of the great things of the design is that from the street, despite the extensive glazing to the elevation, there is a sense of privacy as passers-by cannot tell what’s going on inside. Even at night, when the house is lit up, the elevated block combined with Iwanoff’s combination of clever angles, marble privacy panels and a floor plan that utilises an undercroft garage means people from the street can’t see what the people inside are doing. “It’s open, but you don’t feel like you’re on display,” says Lisa. So that means when certain people drive slowly past, craning their necks trying to get a peek inside *coughs* they pretty much can’t see a thing inside. Some by Acorn Photo, but almost all by me… yes… sorry. I am not a photographer. I know I have quite possibly butchered this architectural icon with my lens. I am sure Iwanoff is weeping in his grave over my photos. Paganin House is on the market with Jennifer Rosenstein from Airey Real Estate and is going to auction April 13th at 12 noon. Definitely one of my favourites of his... this house is just incredible. Was so excited to learn the home was open recently!! I'll just keep dreaming about owning it... great write up - and pretty darn good pics too! Thanks Gino! :) Since I put this up so many people have been coming out of the woodwork as Iwanoff fans, it's so cool. You should try to have a stickybeak at the next home open! Can't wait to do your place. 1976, so ahead of its time! Eric isn't it funny to think that back then open-plan living was still so new and unusual - now it's strange for a newly built house or renovation to NOT have open-plan living areas! Iwanoff was definitely ahead of the curve! Donna I've heard of The Iwanoff Project and just read the other articles you mentioned, love the idea. Very clever and what a great opportunity to bring Iwanoff fans together. When House Nerd and Iwanoff architecture meet, it's very exciting. Thank you very much for capturing these absolutely beautiful and classic representations of architecture and design. What a gem! 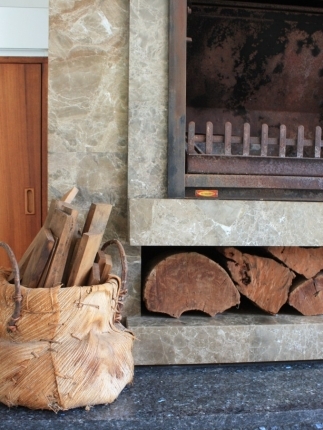 I love how the owners have furnished this gorgeous icon, too. Great pics & story... I think I missed the home open so thanks for sharing! Do we know how much this ended up selling for? Im dying to know. Hi Kittenoff, it achieved a very cool $2.2 million. 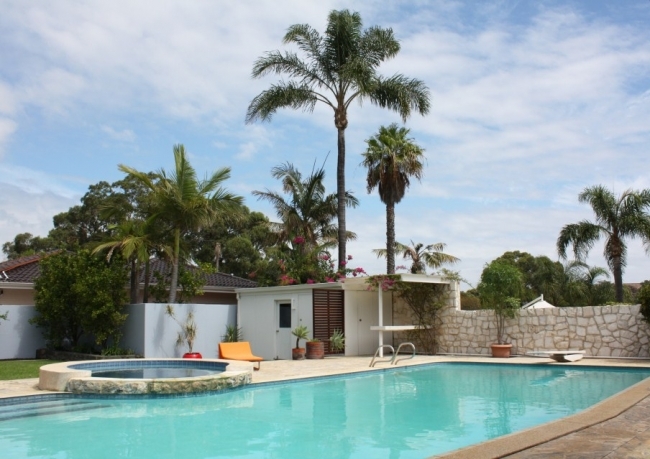 Another Iwanoff just nearby, 59 Oban Road, City Beach, recently went for around $1.7m. That's pretty tidy! My mother owns one of his around the corner, but I think somehow hers wouldn't fetch that much! Ah, you never know! 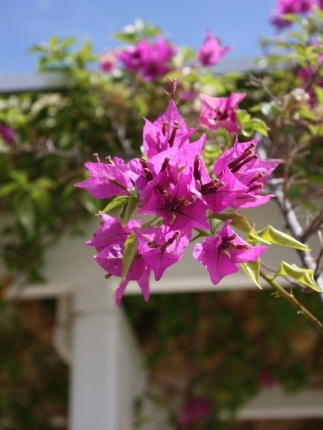 The agent says the owner was absolutely stoked. Which Iwanoff does your mum own (if you don't mind me asking?) I've written about a couple of Iwanoffs in Floreat for the paper in the past, one was years ago and I can't remember the street address, one was on Lifford Road. I'd love for her to tell you some stories. Ill have to work on her although shes very private like that. Ivan was her and my fathers dearest friend. Dad knew him in Bulgaria and mum and he were very close. He used to spend hours at our house doing his drawings and work to get some peace and quiet! She's been in the house for over 50 years now. Amazing. Oh WOW! (again!) I laughed at the thought of him drawing at her place just to get work done, that's gorgeous. If you could convince her, that would be wonderful! Let her know that whenever she's ready, I'm ready :) I'll cross my fingers! Lucky enough to know the owners I got to sit and admire this home on a few occasions. It is truly amazing and so beyond its time. The attention to detail is unbelievable and I was devastated to find out it was being sold.......and before my lotto win.......drats!! Tragically I witnessed this wonderful residence being burnt to the ground this evening, 21 Dec 15. The ferocity of the huge blaze was horrific, fed I suspect by the beautiful wood paneling featured throughout. Incredibly saddened to see yesterday what I believe to be Iwanoff's best representation of his work destroyed. Thanks Maya for capturing so well a beautiful representation of brutalist architecture prior to such a sad outcome.